C9AZ-13A164-B Inner grille bushing, where the hidden headlight hinge pivots. Used outer bushing for the hinge pivots for the hide-away headlights on the Mercury Cougar. Ford part # C9AZ-13A164-A. Hardware for mounting the hood bumpers on the radiator core support. Clip mounts with threads down, nut on top. Sold as a Kit as Pictured. This clip mounts the actuator shaft to the eyelids. Two required for 1967 - 1968, one required for . . . This clip mounts the actuator shaft to the eyelids. Two required for 1967 - 1968, one required for 1969 - 1970. Same clip holds the windshield wiper motor to the wiper transmission. This grille background piece requires you remove your Cougar emblem before installing. To remove the cat emblem you will need to grind from the backside and epoxy the emblem back in place after-wards. D0WB-16A678-A. Grade "A" will be perfect with no dings, ready to sand and paint. No surprises, just excellent quality! D0WB-16A678. This grade "B"unit will only have a minor ding like the one shown here. 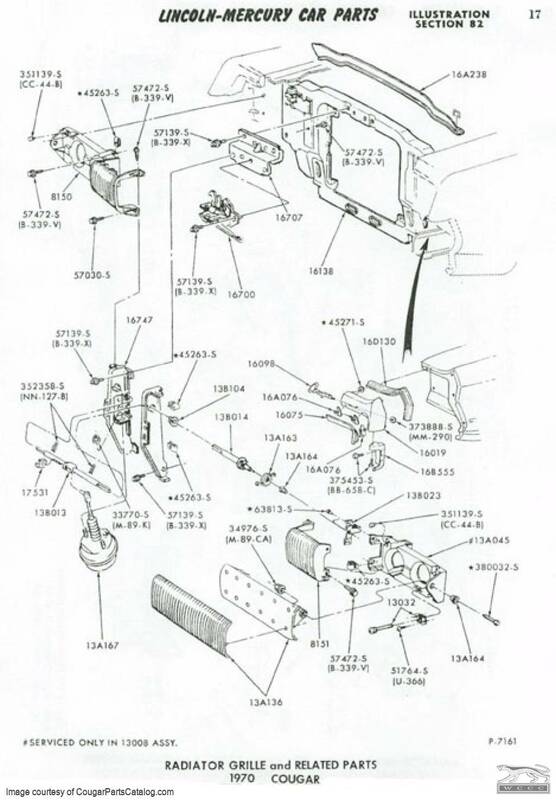 This grade "B"unit will only have a minor ding like the one shown here.Ford part # D0WB-16A678. No road salt on Western roads = less pitting! Used grade "B" driver side (left hand) grille headlight eyelid door for the Mercury Cougar. Captured washer, or spinning washer nut for attaching the headlamp motors or vacuum actuators on the 1969-70 Mercury Cougar. All models, Standard Hard Top, XR7, and Eliminator. Two needed per car, sold individually. Set of 4 rings for all years 1967 - 1973 high beam or low beam. No dings, gouges or broken . . . This is the correct ring for all years 1967 - 1973 high beam or low beam. No dings, gouges or broken . . .